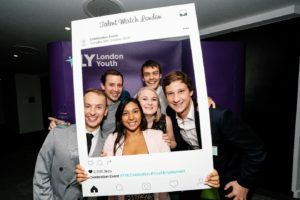 On Tuesday 9th October, the Movement to Work team travelled to Diageo global headquarters in North West London to attend the London Youth’s Celebration Event for their employability programme, Talent Match London. From the top floor of the building, the setting sun lit up the glorious arches of Wembley and momentarily turned North London into honey before the audience took their seats on the conference floor. The night was a celebration of the impressive achievements of over 2,500 young people who had passed through the London Youth programme over the past five years; picking up skills, ambition, and pathways to a career along the way. It was also a celebration of the employers and mentors who had helped facilitate this transformation of young people and provided them with opportunities. The evening was filled with inspiring stories of young people who had overcome great hardship and struggle, but despite this had begun to realise their potential through gaining employability skills.